Fantasy couture’s unique appeal lies in its ability to adroitly whisk viewers away to a wonderland of unimaginable possibility and splendour. 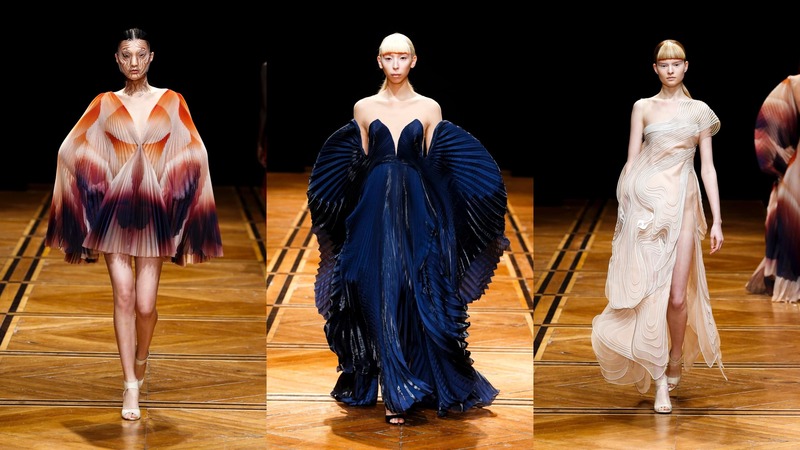 The synthesis between man and nature is a recurring theme in this realm, and the central thesis around which Dutch designer Iris van Herpen anchored her latest collection, entitled “Shift Souls”. 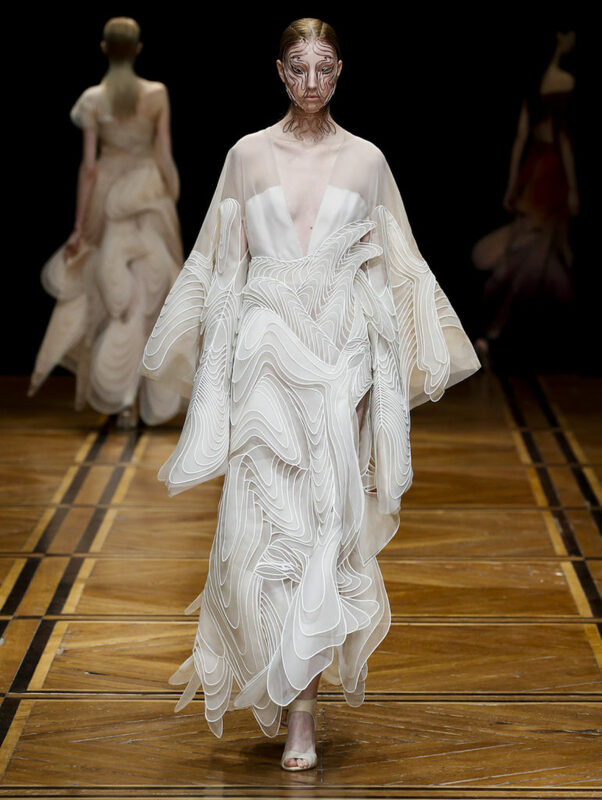 The culmination of an artistic exploration that embraces science, mythology and motion, van Herpen translated humanity’s collective mythological dreaming, since the dawn of civilization, into an array of haute couture creations that debuted at the Musée des Beaux-Arts last week. The 18 garments propelled down the runway were an abstract expression of the female human shape. Traditional fabrics were infused with a range of modern garment-making technologies, creating new and avant garde silhouettes: dissected voluminous layers ranging from pleats to folds and undulating waves. Resplendent in warm pigments of ochre, yellow, purple and indigo, the collection was van Herpen’s most colourful to date — a far cry from her habitually monochromatic obsession. In “Shift Souls”, the human bodies floating down the runway were transformed by van Herpen’s ethereal vision — reminiscent of human/animal hybrids which recall the bestiaries of ancient mythology (“cybrids”). Fabrics of varying structure and shape were employed to create multiple layers of motion. Symbiotic volumes emphasised the malleable nature of human identity, how it can be bent and shaped. Dresses of dimensional gradient silk, bird-like in form, were wed to the female body — an allegory for the transformative state of mythological creatures. Gradient silks, decorated with cartographical line motifs were a fixture of the show. 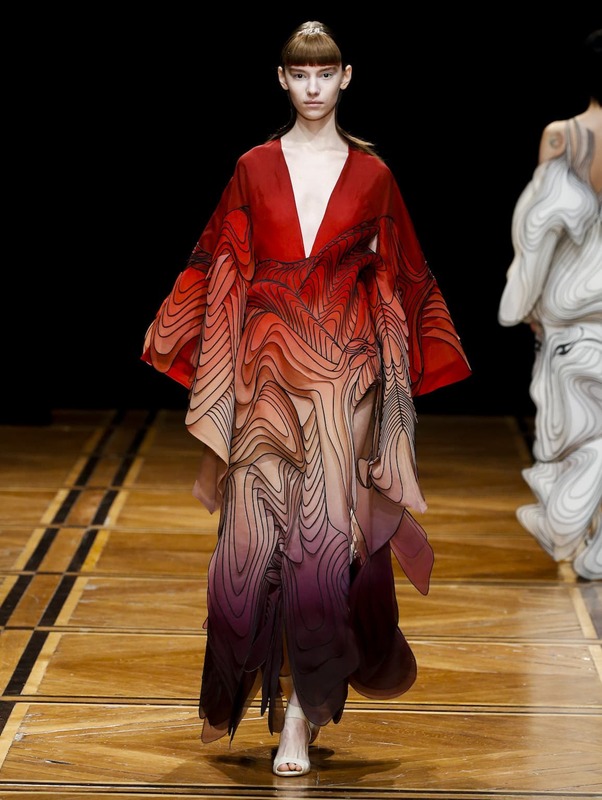 Meant to evoke the fusing of humanity with mythology, van Herpen's bird-like cybrids floated down the runway. Other garments cascaded around the body like three dimensional “wave drawings”, alternating between concealing and revealing anamorphic cadences resembling abstract images of birds and the human face. Fluid in their identity and perpetually in a state of transformation, these spectral silhouettes — seemingly drawn together through the use of topographic lines — were created by manipulating various synthetic and natural organzas. Inspired by the Harmonia Macrocosmic - arguably the most beautiful star map ever published - van Herpen's SS19 designs drew on futuristic expressions of old cartographic language. 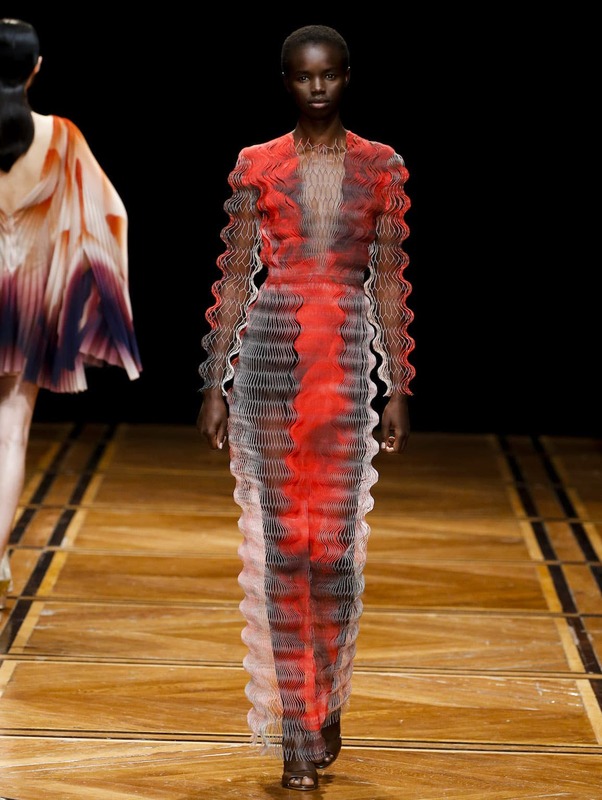 To achieve the affect of a moving 3D wave drawing, van Herpen incorporated organzas of various length and volume throughout the collection. 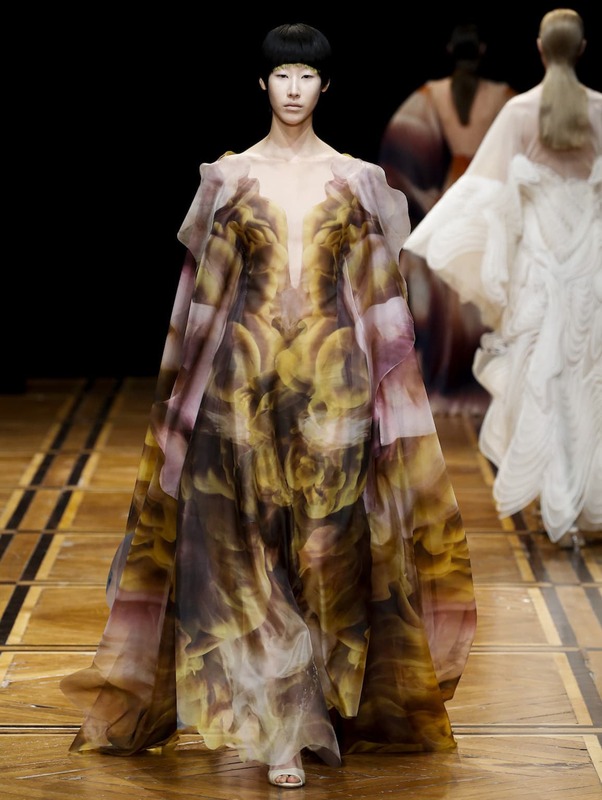 For this presentation, van Herpen collaborated with former NASA engineer Kim Keever to layer his ‘aquatic expressionist’ effect onto the former’s signature cloud dresses. Vaporous coloured clouds were printed onto translucent organza and then layered into nebulous multi-dimensional prints, resulting in optical illusions that contemplate the idea of ephemerality and movement. The resulting amalgamation of both artists’ efforts were dresses whose unfinished contours blurred the boundaries of the body while simultaneously throwing the female form into high relief. 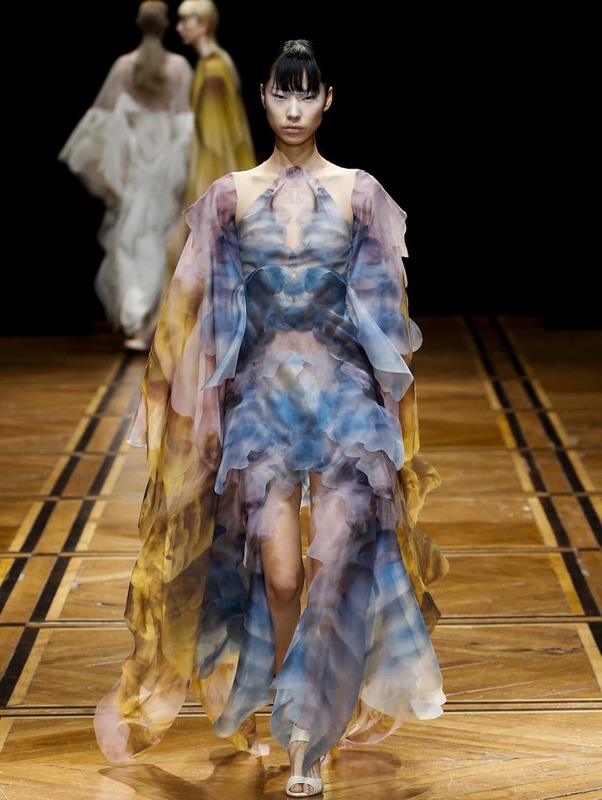 Smoke-like clouds decorated with Kim Keever's aquatic expressionist effect were printed onto van Herpen's translucent cloud dresses. 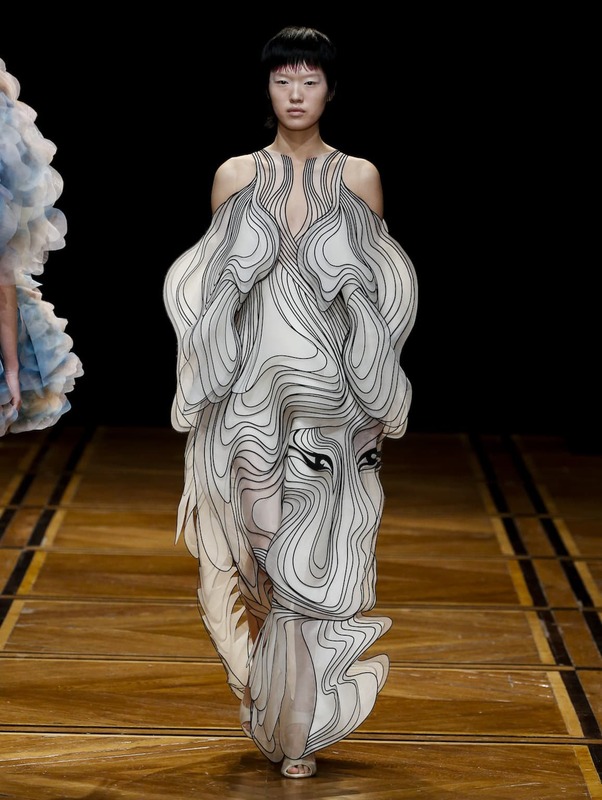 A characteristic van Herpen design, the cloud dress at once accentuates and distorts the archetypal feminine form. Attendees at the show were also introduced to cellchemy – the unique face-jewelry which evidences the versatile applications of 3D technology that are at play within van Herpen’s process. These unconventional adornments were crafted with the assistance of the Delit University of Technology: each piece is 3D scanned, mapped and then printed. Cage-like and wiry, these masks push the collection out of a merely decorative context and into the eerily tangible realm of an identity in flux. The show’s climax was dedicated to van Herpen’s partnership with contemporary artist Nick Verstand, whose work on the surrounding installation resembled a dreamscape of circulating clouds. Models in plexiglass heels floated along the darkened runway under a candelabra of laser light; bathed in a bright white glow emitting from the floor, like some sort of otherworldly aura calling them to “shift souls”.